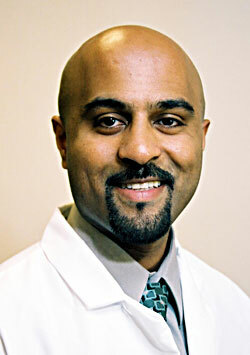 Santosh Kesari, MD, PhD, director of Neuro-Oncology at UC San Diego Moores Cancer Center. Jim Black is fighting the meanest, most aggressive, most common kind of brain tumor in the United States: recurrent glioblastoma multiforme (GBM). In the United States, each year, approximately 10,000 patients are affected by GBM. Now, a novel investigational device – available only at clinical trial sites – is offering new hope to these patients. The non-invasive procedure – called Tumor Treating Fields (TTF) – is delivered using a portable device – called the NovoTTF-100A System made by Novocure. The TTF procedure uses alternating electrical fields to disrupt the rapid cell division exhibited by cancer cells. On average, a patient with GBM survives less than 15 months with optimal treatment and only three to five months without additional effective treatment. The TTF procedure may provide physicians with a fourth treatment option in addition to surgery, radiation therapy and chemotherapy. TTFs inhibit tumor growth by causing cancerous cells to die. The TTF procedure is delivered using non-invasive, insulated transducer arrays (electrodes) that are placed directly on the skin in the region of the tumor. The hat-like collection of electrodes connects to a portable device which is slightly thicker than a laptop and weighs about six pounds. The device sends a low intensity, alternating electric field into the tumor which prevents the cells from dividing and spreading and causes cancer cells to die. The most commonly reported side effect from NovoTTF is a mild-to-moderate scalp rash, beneath the electrodes. The FDA-approved device is intended as an alternative to standard medical therapy for GBM after surgical and radiation options have been exhausted.